1) What is Data? And how it is Importance to the Organization? A collection of facts, Pieces of information from which conclusions may be drawn. Ex: Resumes for managing the human Resources..! The Collection of Interrelated Data is called Database. 3) What is Database testing? Database testing involves testing the behavior of the database when the application is being tested. This may involve testing to see if values are being inserted properly, flags are changing appropriately, validity of data, to ensure if data integrity is maintained. It may also account for performance related to the database. SQL queries can be fired in the database to check if the expected results are achieved. 4) What database testing basically includes? Database testing basically include the following. 3) Performance related to database. 4) Testing of Procedure, triggers and functions. 5) Explain about the difference between Database Testing and Functional Testing? Database Testing is sub-set of Functional Testing and Database Testing is not only part of Functional Testing also part of Performance Testing. 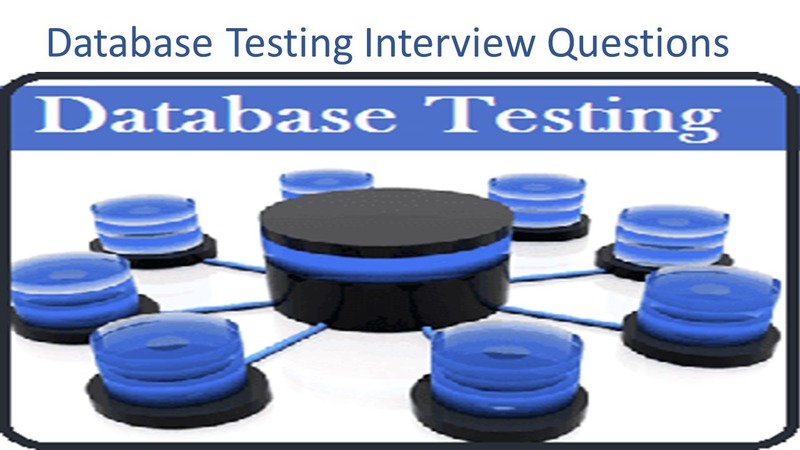 6) What is the primary role of Database Tester? The primary role of the database tester is to see the integrity of database field values. 7) What does Database Object means? A database object in a relational database is a data structure used to either store or reference data. The most common object that most people interact with is the table. Other objects are indexes, stored procedures, sequences, views and many more. When a database object is created, a new object type cannot be created because all the various object types created are restricted by the very nature, or source code, of the relational database model being used, such as Oracle, SQL Server or Access. What is being created is instances of the objects, such as a new table, an index on that table or a view on the same table. 8) What are the major database object types? 9) What commands does database tester generally use & whether they are given privileges to the all tables to access? 10) What is CRUD? Explain it? The end user mainly utilizes the ‘CRUD’ operations facilitated by the DB Tool. C: Create – When user ‘Save’ any new transaction, ‘Create’ operation is performed. R: Retrieve – When user ‘Search’ or ‘View’ any saved transaction, ‘Retrieve’ operation is performed. U: Update – when user ‘Edit’ or ‘Modify’ an existing record, the ‘Update’ operation of DB is performed. D: Delete – when user ‘Remove’ any record from the system, ‘Delete’ operation of DB is performed. 11) How to Test database in Manually? Explain with an example? Observing that operations, which are operated on front-end is effected on back-end or not. While adding a record through’ front-end check back-end that addition of record is effected or not. So same for delete, update … Ex: Enter employee record in database through’ front-end and check if the record is added or not to the back-end (manually). 12) How to check a trigger is fired or not, while doing database testing? It can be verified by querying the common audit log where we can able to see the triggers fired. Before testing Data Base Procedures and Triggers, Tester should know that what is the Input and out put of the procedures/Triggers, Then executeÂ Procedures andÂ Triggers, if you get answer thatÂ Test Case will beÂ passÂ other wise fail. These requirements should get from DEVELOPER. What we normally check for in the Database Testing? 1. The field size validation. 3. Indexes are done or not (for performance related issues). 14) What is data driven test? Data driven test is used to test the multi numbers of data in a data-table, using this we can easily replace the parameters in the same time from deferent locations. 15) What is a way of writing test cases for database testing? You have to do the following for writing the database test cases. 1. First of all you have to understand the functional requirement of the application thoroughly. 2. Then you have to find out the back end tables used, joined used between the tables, cursors used (if any), triggers used(if any), stored procedures used (if any), input parameter used and output parameters used for developing that requirement. 3. After knowing all these things you have to write the test case with different input values for checking all the paths of SP. One thing writing test cases for back end testing not like functional testing. You have to use white box testing techniques. 16) How we do data validity testing? Data validity testing: Testing the correctness and reasonableness of data. Note: Data validity errors are more common and most difficult to detect. 17) How we do data Integrity testing? Date integrity is nothing but enforcing the business rules (facts/data) into database table is called data integrity. Entity Integrity: can be achieved through Primary Key and Unique Key Constraints. Should be tested: whether it is taking duplicate values, Whether it is taking null values. Domain Integrity: can be achieved through Not null, Default, Check . Should be tested: Whether it is taking default values even though if we won’t give, checking the values in the column. Ex: age column should take < 60. Referential Integrity: can be achieved through Foreign Key. Should be tested : Checking Whether “child” rows are deleted or not when a parent row is deleted from parent table. 19) Why back end testing is so important? A back end is the engine of any client/server system. If the back end malfunctions, it may cause system deadlock, data corruption, data loss and bad performance. Many front ends log on to a single SQL. A bug in a back end may put serious impact on the whole system. Too many bugs in a back end will cost tremendous resources to find and fix bugs and delay the system developments. It is very likely that many tests in a front end only hit a small portion of a back end. Many bugs in a back end cannot be easily discovered without direct testing.